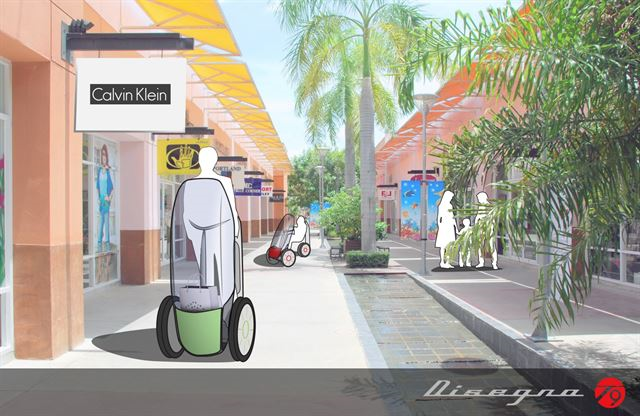 An illustration of smart urban vehicle concept, developed by UNIST in collaboration with Power Plaza Co. Ltd. is expected to debut next year. UNIST is ready to bring nimble, urban-friendly motoring to South Korea’s crowded city centers with a fleet of its brand new ultra-compact foldable electric vehicle for urban mobility. Besides its absolutely innovative design, this electric vehicle concept will feature lightweight body and stunning performance. 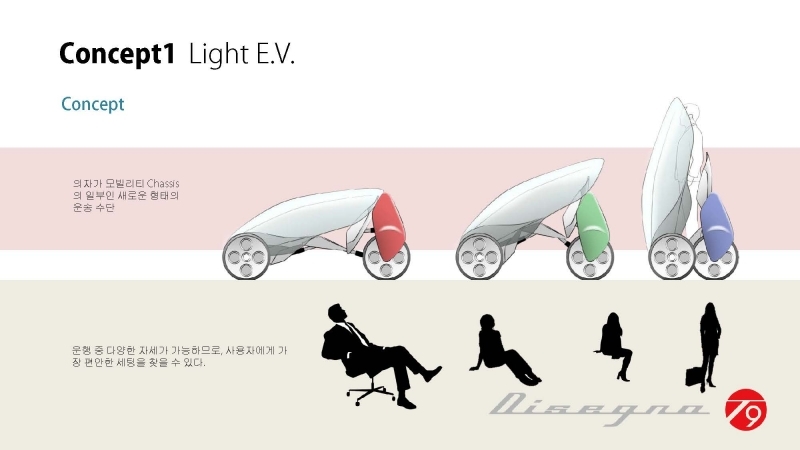 On the morning of June 2nd, a UNIST design team, led by Prof. Yunwoo Jung (School of Design and Human Engineering) has unveiled brand new electric car design that would transform urban transportation. In collaboration with Power Plaza Co. Ltd., an electric vehicle manufacturer based in South Korea, UNIST will carry out this project as part of its “Smart Urban Vehicle Manufacturing Project”. The project aims to address the challenges of living in increasingly congested cities and minimizing the amount of energy we use. “This is a small, folding and smart electric car, but it is also much more than that,” says Prof. Jeong. This new urban-friendly electric vehicle, tentatively named “E-Urban Mobility” folds up for easy transport and provides vertical and horizontal adjustment, which allows riders sit or stand in it while they drive around. The manufacturing process will be greener, and the components lighter, leading to reduced vehicle emissions. 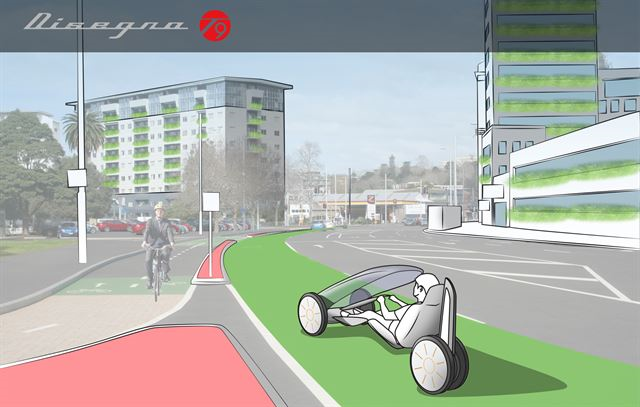 Work has begun on developing a prototype version of the E-Urban Mobility electric vehicle concept for use in cities. This electric vehicle is expected to debut as early as next year and hopefully revealed at the Seoul Motor Show 2017. UNIST President Mooyoung Jung (right) and President SungHo Kim (left) of Power Plaza Co. Ltd. are smiling at the donation ceremony of E-Scooter VX2. 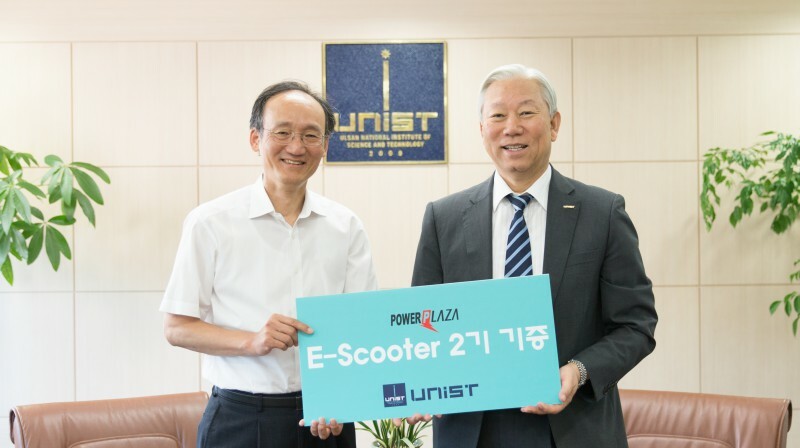 Earlier today, UNIST also held a donation ceremony with President SungHo Kim of Power Plaza Co. Ltd., marking the donation of electric scooters, E-Scooter VX2 at UNIST. These all electric, zero emission electric scooters are worth about 9.5 million won, enabling the users a more convenient and environmentally friendly way to travel. Founded in 1993, Power Plaza has developed, produced and sold 700 kinds of standardized SMPS (Switching Module Power Supply), such as DC-DC and AC-DC converter through constant technology innovation. Currently, it is playing a major role in the domestic industrial power supply market. 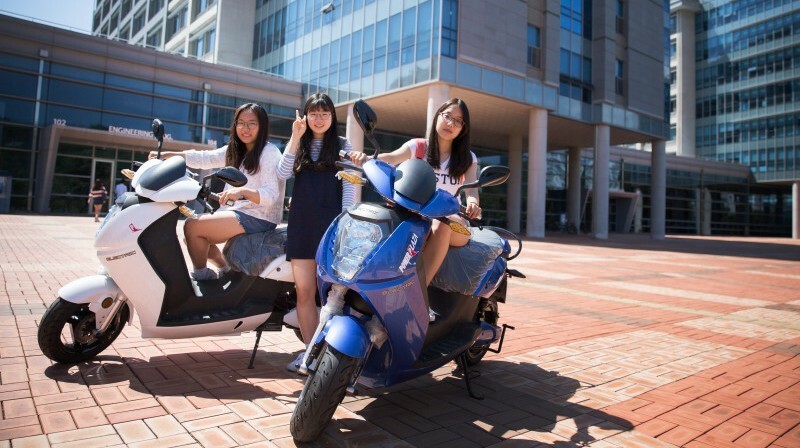 Students are posing for a portrait with E-Scooter VX2, which have been donated by Power Plaza Co. Ltd. on June 2nd, 2016.